Finding unusual foreign foods can be difficult sometimes in Numazu. So when I heard that the Brazilian shop on the south side was reopening under new management I was very excited. 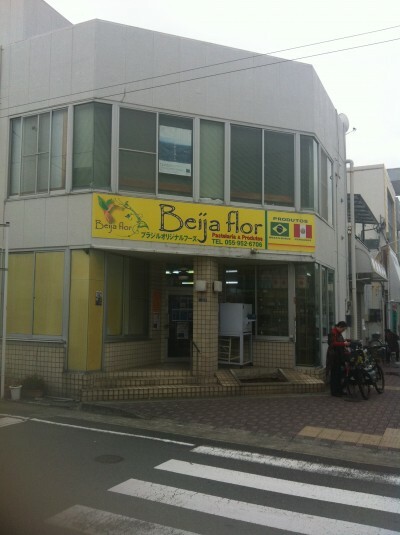 Beija Flor, or in English, Hummingbird, is half pastry shop-half specialty food store on Numazu’s south side. As you enter, a large glass display of mostly savory and some sweet pastries gets your mouth watering. There is even a little bench you can sit and enjoy your freshly made pastry before picking up a few groceries. I was all ready to try some of their great looking pastries when a friend of mine I was meeting at the station decided to be ‘on time’ and I had to leave abruptly. How inconsiderate. While the size of their establishment restricts their range, Beija Flor has an excellent selection of South American specialty foods at very good prices. I was particularly impressed by their wide range of dried beans. Yeah, I know it may seem a little odd to get excited over beans but when you are trying to make something with a little Brazilian flare like a feijoada,, then beans are a must. Beija Flor’s range also includes an interesting selection of pastes, stocks, and mix that will help you to make the perfect Latin dish. They also have a very good stock of meat cuts – meat on the bone in Japan!!! – and real sausage which you might be missing from home. Finally, there is also an intriguing supply of biscuits, sweets, snacks and soft drink local to Brazil and well worth an explore. I particularly recommend trying the Inca Cola. Now, don’t get your mouth all ready for a cola taste, but be prepared for a very tasty creaming soda. Beija Flor is a lovely little shop and well worthy of the support of the local expat community. This is an incomplete list of supermarkets and department stores in Numazu. I have also referenced a few stores a little further afield purely because I think they are worth a look. 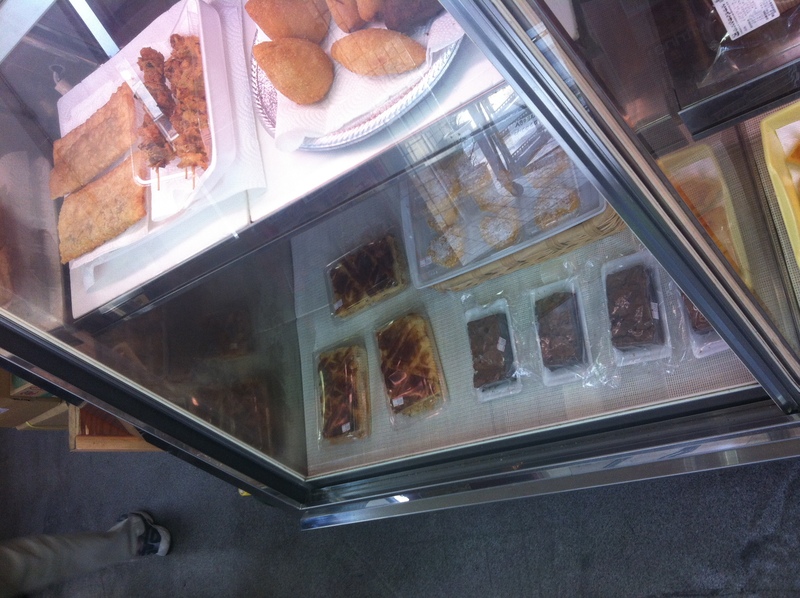 Small to mid sized locals like Marutomo, Potato and Mamy that may not be large but are convenient. Large stores like Seiyu, Max Value and Coop who are generally well priced. Boutique stores like Seibu, Shizutetzu, Komatsuya and Donkihote that have an eclectic range of goods worth a browse. Large supermarket and home-ware department stores like E-spot, Ito Yokado, Cainz, and Sun to Moon than, in some cases are a little out of the way but are very much work a look. If you have any other supermarkets, home-ware stores or departments stores that you think I should add, let me know in the comments below with a general description of the location. Recycle centres in Japan are, as you can imagine, are somewhat different to what we have in the West. There is a great deal of quality stuff out there that is dirt cheap and if you are only spending a year or so in country then it is totally worth a trip to these second-hand shops. A special thanks to one of my mates for putting the cracker under me to get me to post this. Sometimes it takes a gentle cricket bat to the back of the head to realise that you have failed and that once you recover from the starburst shooting from inside your eyelids and your vision returns enough for you to distinguish between colours you must stagger to your feet and resolve the situation. This particular baseball bat came in the guise of a relatively new friend asking where he might find reasonably priced Mexican chili sauce in Numazu. I was stunned. Doesn’t everyone go where I go to get such things? Had I not mentioned this in my blog as ‘the’ place to go to get decent sized condiments? Had I missed out a quintessential element to Numazu that makes life in this beautiful city so very livable? I had hadn’t I? Had I had, he would not have had to ask, had he? The appearance of a universe of sparkly little pixels forming an endless data stream of ‘had’ rebounded off the inside of my eyelids. I needed to back out now, reboot and hope everything would be okay. “The Green and Gold Shop,” I incredulously vomited out of my mouth as I came back to reality. My friend looked a little perplexed and a touch concerned(No doubt he sensed my reaction to his enquiry). To make up for lost time I began to rattle off the wonders that reside within the Green and Gold Shop. I mentioned the large tins of herbs and spice; the fact that they had an excellent selection of western style dried fruits; the multitude of jumbo sized sauces like tomato, BBQ, mustard, Dijon and many things in between; the bargain 1kg packs of grated cheese; the array of stock cubes and broth; the tinned fruit; molasses; the big packs of deep friable everything; peas, 1kg of ’em; frozen fish and meats; bulk packs of pasta and noodles; monster packs of seaweed that you could use for roofing supplies; a small shelf of local community veg; a point card system; and Mexican, bloody, chilli sauce. My now reluctant friend was barely keeping up with the paces of my rail gun list when another friend interjected, “But the Green and Gold shop is not its real name is it?” My breath exploded from my lungs as my hyperactive bubble burst. I slumped back into my chair deflated. My wife patiently took over explaining that the Green and Gold shop is what we call this little bastion of goodness because its signage is in green and bright yellow. Its actual name is “Komatsuya”. My wife explained that you can find it on the south side if you follow the road that commences at the western railway underpass and keep following it down to the end and if you take a right and walk another thirty meters then you will be there. As my wife and my friends cleaned up my verbal melee I realized how remiss I was to not have written about this before and that I needed to share Komatsuya with you too. I have to say that I was driven by the potential of freebies. I had never been to a shopping centre opening before so what better way but to cut my teeth and start small on an opening of a little shopping complex at the Numazu Fish markets called the Numazu Minato Shinsenkan. It was the weather that set the mood for the day; pushy gusts of cold ambushing my wife and me on our bikes as we made our way to the fish market port. The static in the air charged the mind and triggered every kid in the vicinity to foam at the mouth and send their parents to an early grave. Our arrival at the port was greeted by a group of Lucha Libre’s, Mexican wrestlers, plugging in guitars and keyboards and setting up drums. Of course, I didn’t immediately get their connection to the opening of the shopping centre until my wife pointed out that one of the masked men was wearing a mask that could be a loose depiction of Himono, a type of dried fish. Mind you, he could have also been wearing a giant squid on his head with two holes cut into it so he could see out. It was around ten-thirty in the morning and the centre was starting to fill. We made our way into the shopping centre. The centre extended out in a straight line for about 100 meters. On either side of the main walk way ran café’s, restaurants, grocers, fish mongers (of course) and food stores featuring Numazu’s regional specialties. I could see all this easily from the entryway because of my six foot four height and the four foot nothing swarm of hunched over grannies filling up the walkway with wisps of grey and black. My wife charged on into the foray as I hesitated. I have experienced the sheer power of Japanese grannies in the past. Most of these interactions have been during grocery shopping. They are surprisingly nimble and their short stature puts them under my radar as they squeeze their way in front in the check out. If I do however, manage to catch them before they push in, they resort to using their sharp deadly elbows that dig holes into my ribs startling me enough for them to get in front. All the while they tactfully act like sweet little grannies in complete ignorance to the cracked ribs they have just given me. These are the modern day ninja and their name is obaasan. Fear them. Now I stood before a plague of obaasan’s, jostling each other for potential freebies and the best deals of the day. Was I stupid enough enter this frightening mass of predators? For you, dear reader, yes. No more than a few paces into the crowd I took and elbow to the ribs as I was jostled about from stall to stall making sure that every obaasan had a shot at me, all the while my wife danced and dodged the crowd. An ice cold chill ran down my spine as realization dawned, some day my wife will be an obaasan with frightening abilities. As my ribs numbed to the jabs, I started to appreciate what was on offer in this shopping mall. The mall was a display of all the delicacies and local produce of Numazu. Each stall specialized in something. One store I was propelled towards sold a selection of dried seafood goods all packaged and ready to be sent on their way as gifts. Next to each type of packaging was little sample taster jars. I tried a number of dried seaweed and was surprised with their delicate nuances of flavour. In another jar was tiny little fragments of dried fish which exploded with sardine and soy flavours under each crunch. Further around the store I was greeted by a grinning obaasan, a sales woman this time, with an open jar shoved under my nose. It seems to be an universal phenomenon I have noticed during my travels. If you are in a foreign country and the locals can see you are a tourist, then expect their most foul tasting delicacy to be thrust into your face as a challenge. There is no way for you to really win in this predicament. The local has all the cards. If you decline the offering, then you have insulted their culture and they have won. If you taste the offering and spit it out, vomit or even show a hint of displeasure then you have insulted their culture, but at least you tried. The last option is the best for your ego but this time your stomach looses. This is what I have chosen to employ in these situations. It is simple; take the ‘food’ offering eat it while showing absolute delight and then help yourself to more. You have just earned cultural brownie points (of which you may need to eat said brownie as soon as you are out of site to take away the horrid taste) and possibly a new friend. So without looking at the contents, and putting on a big smile, I took the food from the jar and chomped away, and away…and away, at the very crunchy, dried baby crabs covered in sesame seeds and tasting exactly the same way that aquarium fish food smelt when scattered over vomit. It took everything I had to reach in the jar for another, but I did, and that wiped the grin of the obaasan’s face. It seemed like she told the rest of her kind because I noticed far less jabs in the ribs for the remainder of my time in the shopping centre. Traveling up the main aisle I came across a stall that specialized in wasabi, the sinus blasting florescent green mustard most commonly found as an accompaniment to sushi or sashimi. The Izu Peninsula is famous for growing top quality wasabi．This little shop was displaying more that its common paste form you see chugging on you local sushi train. Wasabi rice and prawn crackers were a spicy treat. Though, my favorite wasabi product was the oil. The oil was light on the palate and ended refreshingly well, in a similar way that a good quality extra virgin olive oil leaves your mouth clean and ready for more tastes. Yet further along the shopping centre there was an interesting fish monger with squirming octopus, crab and crayfish. Each fish eye was brilliantly clear with freshness. Even the giant tuna head sitting on totem display for customers to appreciate looked a little curious as to where the remainder of its body went. Finally to top off my tour of the Numazu Minato Shinsenkan, I was greeted by cheeky little characters wearing masks with the funniest expressions I have ever seen. Exaggerated smirks and grins beamed from their masks. Accompanying pelvic trusts and playful trickery heightened their display. Were these the dirty old men sent to frighten the obaasan’s out of the centre before they tore it apart? I never quite figured out the story behind the masked frivolity. But I certainly enjoyed it. All in all, the opening at the Numazu Minato Shinsenkan was a great way to waste a couple of hours until lunch. While the shopping centre is unashamedly focused on the Japanese tourist market, it was really a great way to see what seasonal food offerings there are in the Numazu local area. Not to mention, the really great dining on the boardwalk running along the centre. The Numazu Kaijinsai and Numazu Port Festival is going to be a big event for the Numazu Port area and is happening on the 23 May 2009. So take a trip down to explore, get festive, get cultured and wear your stretchy pants, the food is great. For more information check out the Numazu City Hall, April Newsletter, here. Getting there: From the south side of the station continue to head south directly down the maim road for about a kilometer or so. Check out the here for more details.